Bedbugs are an extremely problematic pest that invades homes. These tiny parasitic insects feed on blood and are active at night – meaning while you’re sleeping, they will feed on you. Bedbugs can easily infest any home, regardless of how clean it might be. If you live in an apartment building, bedbugs can travel into your home from other infested areas. No matter how a bed bug infestation happens, if you believe you might have bedbugs, you need to understand how to control the problem. Difficult to eradicate and frustrating to deal with, here’s how to prevent and get rid of bedbugs in any home. There are several steps you can take to pre-treat your home before you try to eradicate bed bugs using available treatment options. These steps should also be taken regularly to prevent a bedbug infestation if you do not currently have them. Reduce Clutter. 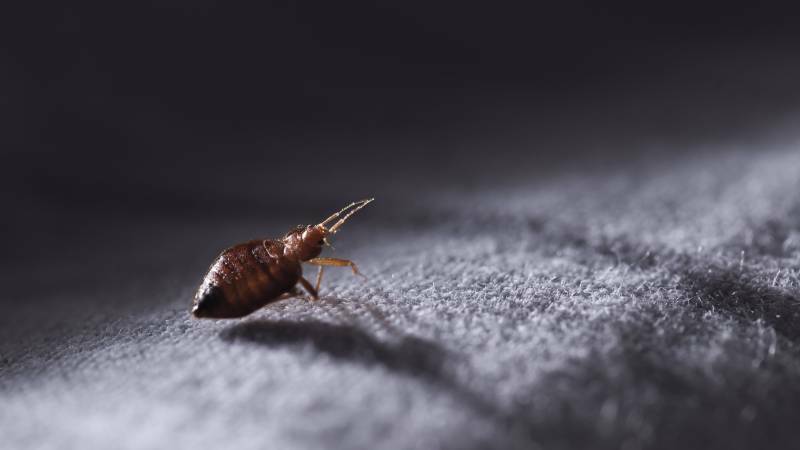 Bedbugs love to hide in mattress seams, furniture, and headboards, but they’ll hide anywhere there’s a crevice. To provide them with fewer areas to hide, reduce the clutter in your room. Keep the floors cleared of debris and make certain that you dust frequently. Launder Infested Garments and Linens. You should remove all of your clothing and linens and wash them in hot water. Any items that can’t be washed, such as shoes or stuffed animals, should be placed in the dryer and dried on high heat for at least 30 minutes. After you have laundered your clothing and linens, dry them in the dryer on the hottest heat setting as well. Clean Thoroughly. Vacuum your mattress and the surrounding carpet. With a wire brush, clean the seams of your mattress and vacuum them, too. You should make certain to vacuum frequently to keep bedbugs away. When you are finished vacuuming, place the contents in a tightly sealed plastic bag and immediately dispose of it in an outdoor garbage container. Use a tightly-fitting zippered mattress cover on your mattress to keep bed bugs from getting in or getting out. If you wake up in the morning with tiny bites that itch, you may have a bedbug infestation. This is especially true if you recently returned from traveling or purchased a used mattress, couch, or other piece of furniture. You can conduct an inspection to see if you have bedbugs. Take a flashlight and carefully examine the seams of your mattress and your other upholstered furniture. If you see tiny reddish insects, you have an infestation. You might also see reddish smears on your mattress. The bites are red and small, and they itch. If you find bedbugs or see any other signs of an infestation, it’s important to take action. Bedbugs will spread from room to room, and they may also spread into neighboring apartments in multi-unit complexes. You can encase your mattress and box springs with a zippered cover as previously described after thoroughly treating it. However, you might want to dispose of your mattress if it’s infested with bedbugs and get a new one instead. Clearing your home of bedbugs may require you to use insecticides, and many of the most effective ones cannot be used on mattresses. You’ll want to treat your bedroom and bed with insecticides that are not harmful if you plan on keeping your mattress. If you choose to get a new mattress, treat your bedroom before you move it in, or the bedbugs may simply infest your new mattress, too. You should also treat your carpets and all pieces of upholstered furniture in your home. Getting rid of bedbugs is difficult, but it’s important to treat everything to prevent them from spreading and making the situation worse. Getting help from a bedbug professional is the best way to get rid of bedbugs easily and effectively. Bedbug professionals use chemical treatments that aren’t available to the average person. A bedbug professional will come to your home and conduct a thorough, careful inspection. They’ll determine the extent of the infestation and what the best method is to treat all of the areas where the insects are hiding. It’s best not to wait to call for professional help. If you do, the bedbugs will quickly spread. Search for a bedbug professional immediately if you see signs of infestation. Bedbug professionals normally have to make multiple visits to your home to get rid of the bugs. Their services will include monitoring to check for any bedbugs that have been missed. Treating bedbugs is an extremely complex process, but it’s possible for you to end your infestation with the help of a professional. With a professional, you’ll know your bug problem is gone for good. Interested in finding a bed bug professional? Start a search today.